This post and it's tagline as seen in Facebook Instant Articles . 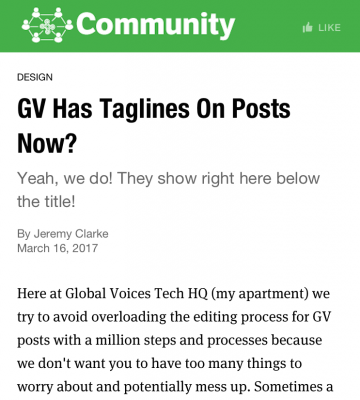 Here at Global Voices Tech HQ (my apartment) we try to avoid overloading the editing process for GV posts with a million steps and processes because we don't want you to have too many things to worry about and potentially mess up. Sometimes a new feature is worth it though, and this is one of them. 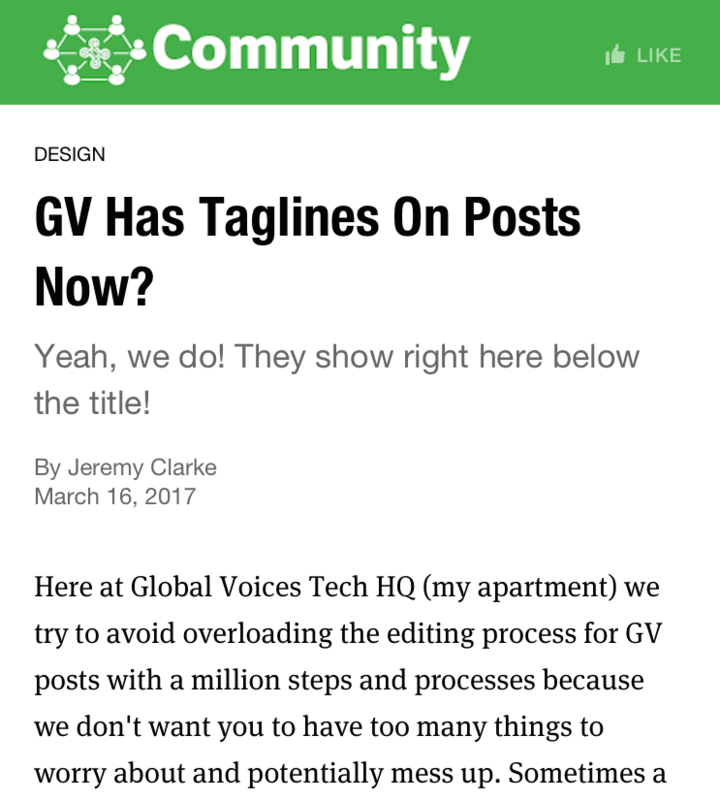 From now on when we refer to “taglines” at GV, we'll mean the single line of text that shows below the post's title, but above all the other content. There are other names for this piece of metadata used by different systems, but we will call it “tagline” to avoid confusion. Facebook calls it a “subtitle” for some reason, which is really confusing for people who subtitle videos amirite? The idea of a tagline is sort of like “the first line of the post” and in many cases it can be the same interesting, attention-grabbing, punchy text that you'd use at the beginning of a story. For it to be “the tagline” though, we have to enter it in a special location outside the post content in a special field, similar to the excerpt. This is so that various systems (our theme, Facebook Instant Articles, Google AMP etc.) can display the tagline in a special way. 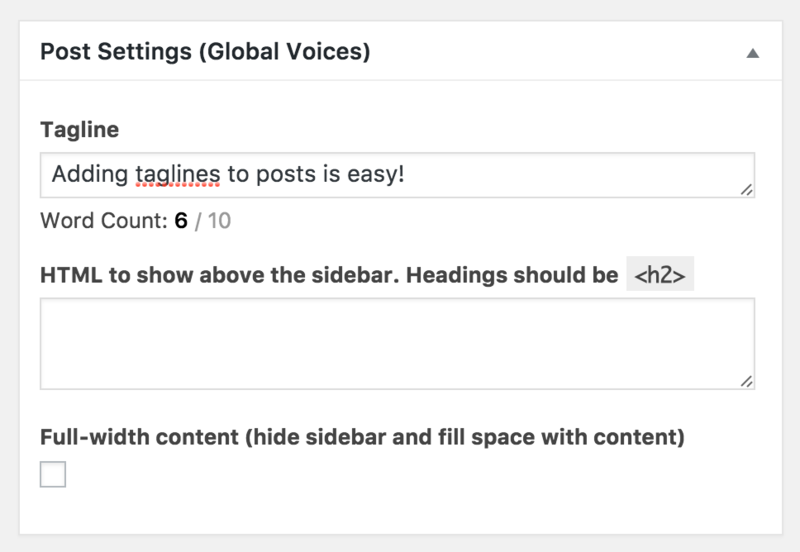 Adding a tagline in the GV Post Settings section of the post editor. 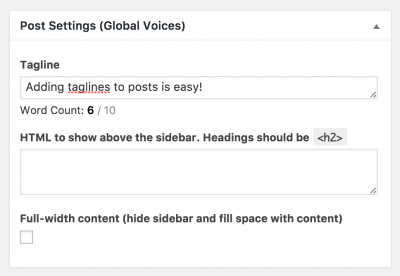 Find the Post Settings (Global Voices) box in the WordPress post editor. Enter your text in the Tagline box. Save the post (won't affect preview until it's manually saved), then preview. Since taglines are a single line of text that describes the post and pairs with the title, a very natural question is “how is this different from the excerpt? The short answer is that they will be used in different circumstances and shown in different ways. Excerpts are NEVER shown alongside the actual post content, so they can duplicate/repeat content from inside the post. Excerpts should make sense on their own when paired with the title, like a summary of the full post. Taglines are shown directly above the post content, so it's important that they never repeat the post content itself. It's okay if taglines are just a tease, and require the rest of the post to make sense. All posts still REQUIRE an excerpt, even if they have a tagline! Taglines are optional for now, unlike excerpts. Make sense? Great! Thanks for your attention, please get in touch  if you have any questions or bug reports!